A month later, I was paired up with my mentee Aylin. She had a beautiful one month old daughter named Sophia. At ﬁrst, I didn’t know how to interact with a teenager as my daughter is 26 years old and I have never been a mentor. After a short while, Aylin and I were spending time together and having so much fun. I thought to myself, “She actually likes hanging out with me.” I couldn’t believe it. Now, almost a year later I have seen the wonderful things God is doing in her life. She is on track to graduate, has applied to get her green card so she can begin working after graduation, and is applying for college grants and loans. She has become a leader and a role model to the other mentees by taking the initiative to coordinate rides for the girls, inviting other girls from her school to attend our monthly club meetings, and consistently participating in all of our fundraisers. 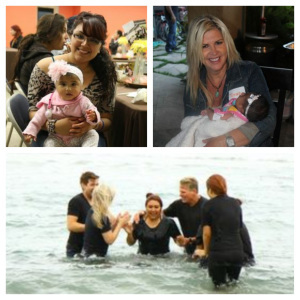 She has been attending RockHarbor Huntington Beach (RHHB) on a regular basis. I am super excited to share that she was recently baptized in the ocean at RHHB’s beach service and I had the privilege of laying hands on her as she was submerged into God’s beautiful ocean. Being a part of this ministry has brought me so much joy and I truly feel blessed to be a part of each of the girls’ lives. I believe that supporting teen moms is an important way for us to help bring awareness to pregnant girls that there are support systems available and that this knowledge just may help them choose the precious gift of life for their babies.